Unlike many other Trump nominees Wilbur Ross makes some Republicans nervous, and has common ground with some Democrats. In fact, the Commerce Secretary nominee was once a Democrat himself. He's won the the support of labor unions, and saved tens of thousands jobs buying and basically rescuing bankrupt steel companies. Democrats largely offered Ross a warm reception Wednesday at his confirmation hearing. Sen. Richard Blumenthal, D-Conn., said he was impressed by Ross' decision to sell off a huge portion of his assets to avoid conflicts of interest. As some Democrats praised Ross, however, some Republicans expressed deep concerns. Both Ross and Trump have talked about protecting U.S. businesses by erecting tariffs against foreign competitors, and that makes many free-trade republicans nervous. Unlike many other Trump nominees Wilbur Ross makes some Republicans nervous, and has common ground with some Democrats. In fact, the Commerce Secretary nominee was once a Democrat himself. He's won the the support of labor unions, and saved tens of thousands jobs buying and basically rescuing bankrupt steel companies. 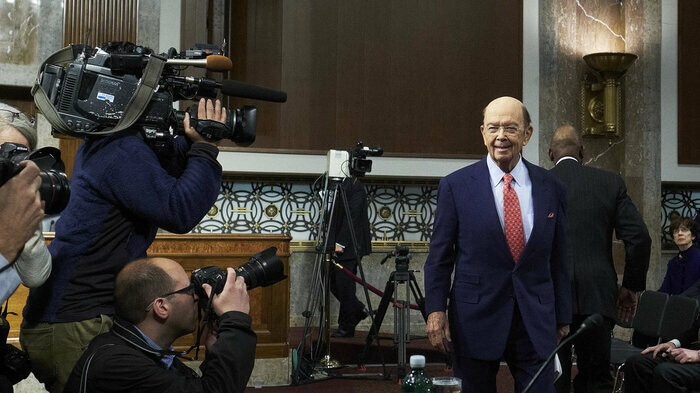 Democrats largely offered Ross a warm reception Wednesday at his confirmation hearing. Sen. Richard Blumenthal, D-Conn., said he was impressed by Ross' decision to sell off a huge portion of his assets to avoid conflicts of interest. "I don't want to embarrass you or presume, but of all the billions of dollars in holdings that you own now, you have divested more than 90 percent," Blumenthal said. "You have resigned from 50 positions. The process has been enormously complex and challenging and costly to you personally." The senator's followup question: "You were able to do it — why not the president?" Ross declined to address that head-on, saying he didn't know enough about Trump's finances. As some Democrats praised Ross, however, some Republicans expressed deep concerns. Both Ross and Trump have talked about protecting U.S. businesses by erecting tariffs against foreign competitors, and that makes many free-trade republicans nervous. Sen. Todd Young, R-Ind., said a lot of people in his state work for foreign companies. "Subura in Lafayette employs 5,000; Toyota in Princeton, 4,500 Hoosiers," Young said. "These jobs provide a secure, middle-class income at a time when a lot of people are anxious about their ability to land those jobs and keep them. Can you reassure the tens of thousands of autoworkers and others whose jobs rely on free trade that their jobs will not be put at risk by restrictive tariffs?" Ross said that he had no intention of damaging the U.S. economy by starting a trade war, but also that if other countries cheat — break trade agreements — tariffs are crucial for enforcement. "We are a country of the rule of law," the nominee told senators. "Some of these other countries are instead the law of the ruler. That's an asymmetry that permeates all kinds of sectors of their economies and ours, and we need to deal with that." But Ross said that he preferred carrots to sticks in dealing with trading partners, and that he'd start by going after unfair trade barriers imposed by other countries. "It's a little weird that we have very low tariffs and china has very high tariffs," he said. "That seems to me as a bit of an imbalance."